Summer is enjoying the fruits of your labor and letting us take care of the yardwork. 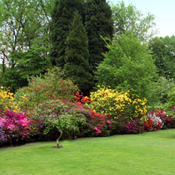 Advantage can prepare your landscape for the challenges of summer - with meticulous spring clean-ups and ornamental bed preparation, lawn maintenace and mowing, judicious pruning, proper nutrients, and insect and disease protection. Summer is the best time to install patios and walkways or begin a construction project using stone or landscape block. The weather is hot and dry, perfect for "hardscaping" projects. Sit back and relax during the summer because Advantage has you covered!